Morcilla is a classic Spanish sausage made from pig’s blood and spices. 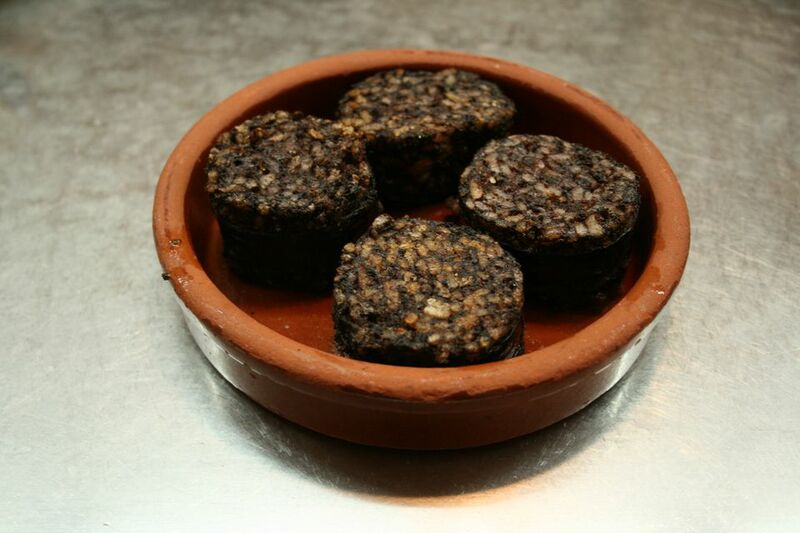 The two most typical varieties are morcilla de cebolla (onion) and morcilla de arroz (rice) although, like all Spanish cuisine, there are regional differences. Morcilla de arroz is generally the type used when frying and it's easy to prepare this authentic Spanish tapa in less than 10 minutes. Spanish-style blood sausage is available in ethnic grocery stores and via suppliers on the internet. Check links to internet suppliers in the United States in where can I buy Spanish food? Cut the morcilla into thick slices approximately 1-inch thick. Add oil to a frying pan (8 or 9 inches) and heat on medium. When the oil is hot, add morcilla slices and fry on both cut sides for 3 to 4 minutes each. While morcilla is cooking, cut the baguette into 1/2-inch slices. Top each piece of bread with a slice of morcilla. Secure the morcilla with a toothpick.